You are here: Home>Archive>Taylor Brown Collection.>Marriages.>Walter Eric Brown and Muriel Churcher on their wedding day. Walter Eric Brown and Muriel Churcher on their wedding day. 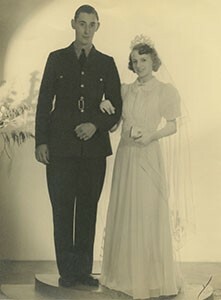 Old photograph showing a formal wedding picture of Mr. Walter Eric Brown and Miss Muriel Churcher, 29th June 1940. The groom is on the left and is in full uniform, the bride has her arm linked through his. She is wearing a full length gown which has short sleeves and a round neck, with a brooch at the collar. Her veil reaches to the floor and is held in place by a headdress She is carrying a small white book.